Seasonal flu (influenza) is an infection caused by a virus that can affect your nose, throat and lungs. People tend to get it around the same time every year. In the UK, people usually get seasonal flu between December and March, although outbreaks can happen as early as October and as late as May. What are the different types of flu? You might also get a runny nose and burning or painful eyes that are particularly sensitive to light. The symptoms of flu tend to appear quite suddenly, within two to three days of getting infected. Although the symptoms of flu can be similar to a common cold, they are usually more intense. If you have flu, you’ll feel much worse than if you have a cold. And if you have a cold, you’ll have a runny or stuffy nose. If you catch flu, it’s important to get plenty of rest and drink enough to stay hydrated. You can take paracetamol or ibuprofen to help reduce the fever and pain. Ideally, it’s best to stay off work or school (for children) for about a week. This will give you time to recover and prevent spreading the infection to others. Most people start to get over the flu and feel better after a week. But it may take some people longer than this to get better. If your symptoms don’t start to improve after a week or if they get worse, you should contact your GP. Also contact them if you get other symptoms, particularly chest pain or breathlessness. Symptoms like these can mean that you may be developing a more severe condition, such as pneumonia. Flu spreads easily via droplets in coughs and sneezes. Your hands can also become contaminated with the virus, which means you can spread it from the surfaces you touch. To help prevent spreading flu, cover your mouth and nose with a tissue when you cough or sneeze, and wash your hands regularly with soap and water. Best of all, stay at home if you can. You can improve your chances of not getting flu at all by having the flu vaccine – or flu jab – each year. People who are at a higher risk of complications should get the flu vaccine every year. If you need advice from a doctor, contact your GP surgery by phone first. This is because there’s a risk of spreading the virus to others, who may be more vulnerable. Your GP surgery may ask you to visit at a specific time, or they may give you advice over the phone. 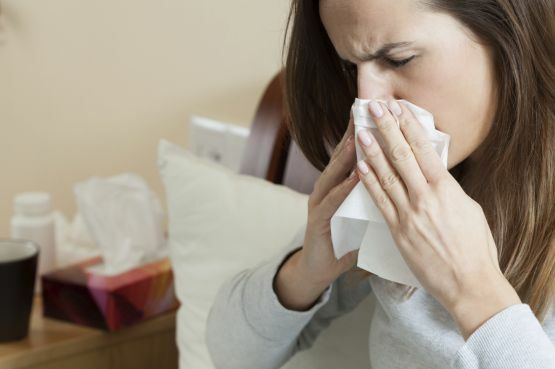 The common cold is an illness caused by a virus, most often the rhinovirus. Viruses are tiny parasites.